A promotional sales brochure advertising the 1959 Ford Thunderbird. 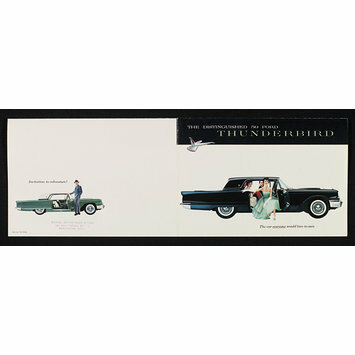 The front of the brochure depicts a photographic image of a black Ford Thunderbird containing four passengers. One of the passengers, a woman wearing a turquoise cocktail dress, is stepping out of the car. The back cover depicts a night scene showing a pink Ford Thunderbird, containing four passengers, driving alongside a river. On the inside of the brochure there are images showing people using their cars; some have the roof down, some have put the seats down to make more room whilst others are unpacking a large number of suitcases from a spacious boot. There is also a lot of information promoting the car by highlighting its specifications and unique selling points.